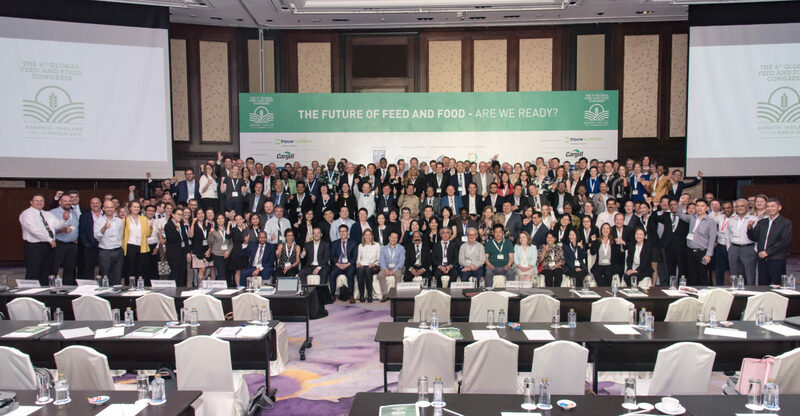 Bangkok, Thailand – Global feed and food leaders discussed the future of feed and food at the 6th Global Feed & Food Congress (GFFC) in Bangkok, Thailand. Organized by the International Feed Industry Federation (IFIF) with technical support provided by the Food and Agriculture Organization of the United Nations (FAO) and in collaboration with VIV worldwide, delegates at the 6th GFFC examined the global challenge to provide safe, affordable, nutritious and sustainable animal protein sources through innovative solutions to feed 9 billion people by 2050. The Honorable Dr. Sorravis Thaneto, Director-General of the Thai Ministry of Agriculture’s Department of Livestock Development joined Dr. Daniel Bercovici, IFIF Chairman, Dr. Berhe Tekola, Director of FAO’s Animal Production and Health Division and Mr. Pornsil Patchrintanakul, President of the Thai Feed Mill Association, to open the Congress. They welcomed 300 world-class experts and executive level delegates from Asia, Europe, Africa, the Middle East and the Americas representing feed and food chain stakeholders from over 50 countries. The 6th GFFC was a great success and holding it in Thailand places it at the heart of a fast-growing region for the feed and food sector, Daniel Bercovici points out, while the focus on the future of the feed to food chain is timely, given the imperative of finding innovative solutions to feed a growing world population. Over 35 world-class speakers, including CEOs, leaders, and experts from global feed and food companies, international organizations and the scientific community, provided their insights and expertise at the 6th GFFC sessions that covered key aspects of the future of the feed and food value chain, with a special focus on the digital revolution in agriculture, sustainability, feed & food safety, nutritional innovation, global regulations & policy, and trade and market developments. The excellent plenary sessions were followed by a global leaders panel, which included Dr. Rob Koremans, CEO of Nutreco, Joe Stone, Executive Vice President and Chief Risk Officer at Cargill, Dr. Mark Lyons, CEO of Alltech and Dr. Berhe Tekola, Director of FAO’s Animal Production and Health Division. The global leaders discussion with delegates touched on critical issues facing the agri-food chain, including sustainability, how to drive innovation, the importance of a balanced regulatory framework, capacity development as well as free and fair trade, and highlighting the importance of cooperation and partnership not only with industry and chain partners, but also with other stakeholders. For more information and to view the full 6th GFFC programme please visit www.gffc2019.com. The Global Feed & Food Congress (GFFC) series was launched in 2005 by the International Feed Industry Federation (IFIF) in cooperation with the Food and Agriculture Organization of the United Nations (FAO) to provide a global platform for scientists, industry, governments, civil society and intergovernmental organizations to come together to discuss critical issues of food and feed safety, technology, innovation and sustainability. The tri-annual Congress has established itself as the leading global event of its kind and was last held in Bangkok, Thailand in March 2019. For more information please visit http://www.gffc2019.com/. The International Feed Industry Federation (IFIF) is made up of national and regional feed associations, feed related organizations, and corporate members from around the globe, representing over 80% of the feed production worldwide. IFIF provides provide a unified voice and leadership to represent and promote the global feed industry as an essential participant in the food chain that provides sustainable, safe, nutritious and affordable food for a growing world population. For more information on IFIF please visit www.ifif.org or contact Alexandra de Athayde, Executive Director, at info@ifif.org.